Reverend W. Wilks is a well-known English cooking apple, very much in the vein of the Victorian culinary apple tradition, although it was developed a bit later, in the early 1900s. 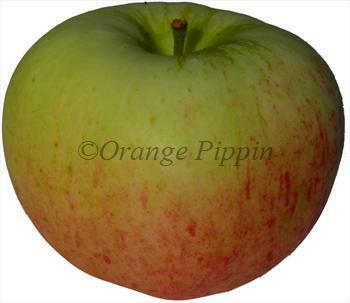 It is thought to be derived from Ribston Pippin and Peasgood Nonsuch, both well-regarded English culinary apples. Reverend W. Wilks ripens at the end of August and produces a well-flavoured tangy but sweet puree when cooked. The apples are large and juicy, but less sharp than some later-season cookers such as Bramley. Please fill in the details below and we will let you know when Reverend W. Wilks apple trees are back in stock. Peasgood Nonsuch is a highly-regarded old-fashioned English cooking apple. Reverend W. Wilks is in flowering group 2. Reverend W. Wilks is self-fertile and does not need a pollination partner, although fruiting may be improved if there is a compatible tree of a different variety nearby. Reverend W. Wilks is a good choice for anyone wanting an easy early-season cooker. It is easy to grow, heavy-cropping, reliably self-fertile, and has excellent natural disease-resistance. The tree is a compact grower. The only issue to look out for is a tendency towards biennial-bearing - fruiting only every other year as it gets older. This can be addressed by heavy thinning of the fruitlets in early June of the "on" year. Developed by Mr Veitch of Chelsea at the start of the 20th century, and quickly recognised by the RHS (it received an Award of Merit in 1904).